It's only a couple of tents, but Occupy Toronto has set up a second camp â this one at Queen's Park. Composed of protesters who had formerly occupied St. James Park, the formation of the new camp comes as a response to warnings issued by Mayor Rob Ford and other city staff that the initial occupation may come to an end. City Manager Joe Pennachetti revealed on Thursday that the City would take steps to end the protest at St. James Park as early as next week. "Starting next week, we will have more discussions with those people at the site," he said. "And we will be moving forward with appropriate steps relative to that site. That will occur starting next week. I'll just leave it at that for now." 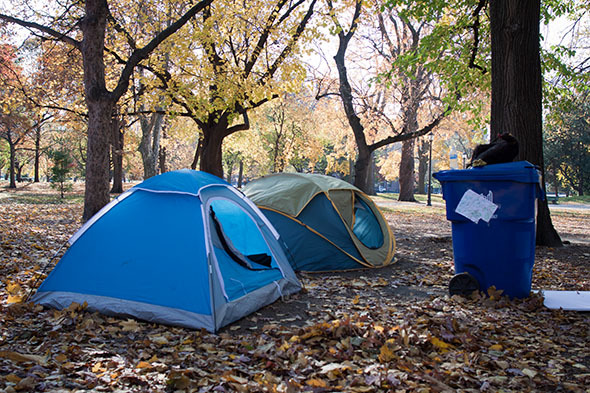 Protesters at the Queen's Park camp asked not to be named, but explained that they hoped the new location might pose jurisdictional problems for the City of Toronto due to the camp's proximity to the provincial legislature. When asked about the Occupy Toronto movement last week, Premier Dalton McGuinty characterized it as a municipal issue to be dealt with by the mayor. It remains to be seen, however, if this new location will actually complicate the City's ability to remove the occupiers. It's also unclear whether or not Occupy Toronto 2.0 will amount to anything more than a couple of tents. If it does, Ford may have an even bigger problem to deal with than he thought.